Jane Felix-Browne, a 51-year-old grandmother from Moulton, a village in northwestern England, said in a telephone interview with The Associated Press that she met Omar bin Laden, 27, while riding a horse near Egypt's Great Pyramid and they married on April 24. The Times and Sun newspapers, which initially reported the story, said she was in Egypt for medical treatment for multiple sclerosis at the time. Felix-Browne confirmed that, and said she was returning to Egypt this weekend for further treatment. She said she would not meet her husband there, but they talk each day via Internet. She was not at her home when an AP reporter visited it Wednesday, but said in the telephone call that she had moved to an undisclosed location to escape media attention. The couple held Islamic marriage ceremonies in both Egypt and Saudi Arabia, Felix-Browne said. She said she was his second wife - Islam allows men to have up to four wives. 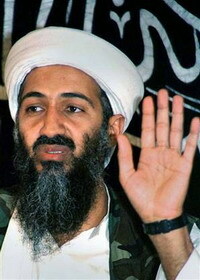 There was no independent confirmation of her claim that she married him or that he was indeed Osama bin Laden's son. The Sun printed a copy of what it said was their wedding certificate and pictures purportedly showing the couple in Egypt. Felix-Browne, who also uses the name Zaina Mohamad, is a parish councilor, with three children by previous marriages and five grandchildren. This would be her sixth marriage. She said she was hoping to arrange a visa for her new husband to visit Britain, but acknowledged it would be difficult. Because her husband's name is bin Laden, he finds it very difficult to travel anywhere, and would probably not be accepted in her village, she said. Felix-Browne said she would one day like to meet her father-in-law to find out if he really is the mastermind behind the terrorist atrocities he is accused of. She said the world could benefit from such a meeting if she was able to discuss peace with him. Felix-Browne said she married the son, not the father. "I fell in love with Omar. He's an innocent man who I never judged by his father's reputation. Only after we were together two months did I ask him about Osama," she said. The newlyweds were last together in May, when she spent three weeks at his home in Jeddah, Saudi Arabia, she said. Jean-Charles Brisard, co-author of "Bin Laden: The Forbidden Truth," said the al-Qaida leader does have a son named Omar. Osama bin Laden remains in hiding nearly six years after his al-Qaida terrorist network carried out the Sept. 11, 2001, attacks. In a new audiotape Tuesday, al-Qaida second-in-command Ayman al-Zawahri threatened Britain with more attacks, accusing London of defying the Islamic world by honoring novelist Salman Rushdie. Last month, attackers failed in two separate car-bombing attacks in London and Glasgow. In July 2005, four suicide bombers killed more than 50 people in coordinated bombings on London's transit system. Felix-Browne said her husband, a scrap dealer and one of 18 brothers, was raised in Sudan and Afghanistan after his father left Saudi Arabia. She said the father and son last met in Afghanistan in 2000, the year before the Sept. 11 attacks on the United States and a subsequent U.S. bombing campaign on Afghanistan that toppled the Taliban rulers who had harbored Osama bin Laden. She said Omar was training to be a solider in Afghanistan at the age of 19, when he left his father "because he wanted to see the world and didn't want to fight and die young." News of the nuptials caused a ripple of excitement in Moulton - a quaint English country village more accustomed to community fairs and dances than international media attention. "It gave me goose bumps when I heard the news," said nursery supervisor Gill Targett, who knew Felix-Browne. "It's all very scary considering what Osama bin Laden has done to so many innocent people. He's still a relation, and blood is thicker than water."